WASHINGTON – Republicans are talking a lot about the Green New Deal after its rollout on Capitol Hill this month by liberal Democratic Rep. Alexandria Ocasio-Cortez. It's not because the GOP supports the transformation of the electric grid from fossil fuels to renewable energy called for in the plan to combat climate change. Or because Republicans agree with the approach the plan lays out for boosting Americans' economic security and giving people access to affordable health care. GOP officials expect the road map offered by Ocasio-Cortez, D-N.Y., and longtime environmental advocate Sen. Ed Markey, D-Mass., will help them hammer home their criticisms of Democratic economic policies they contend would move the country toward socialism. 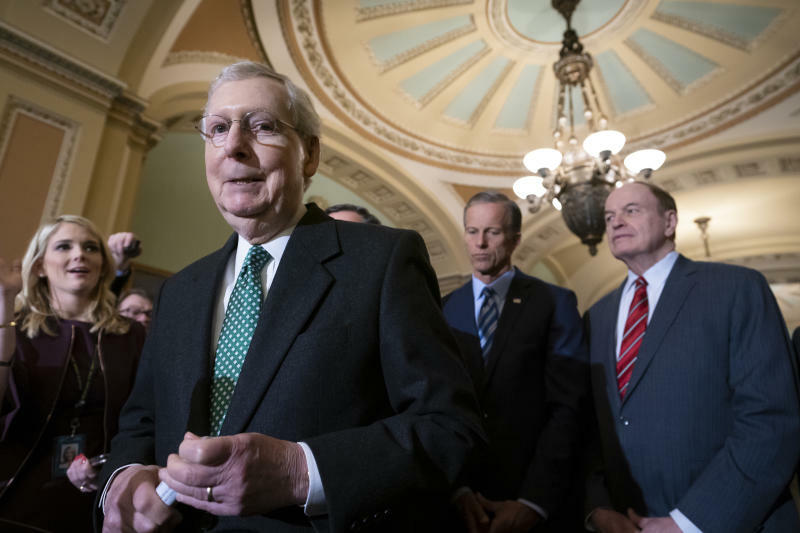 Senate Majority Leader Mitch McConnell, R-Ky., convinced the plan is a loser for Democrats, announced Tuesday that he plans to bring up the measure for a Senate vote "to give everybody an opportunity to go on record to see how they feel about the Green New Deal." That would mean putting several Democratic senators who are running for president, including Elizabeth Warren of Massachusetts, Cory Booker of New Jersey and Amy Klobuchar of Minnesota, in the position of angering liberal voters if they don't back the plan or turning off those independents who view it as too liberal. Opening a discussion on the Green New Deal carries risks for Republicans as well, said former Rep. Carlos Curbelo, a Florida Republican who co-founded the bipartisan Climate Solutions Caucus. "When Republicans controlled Congress, this was not getting attention," Curbelo, who does not support the Green New Deal, told USA TODAY. "That's going to change, and everyone soon will have to go on the record, not just expressing what they're against but what they're for." Dozens of Democrats have gotten behind the Green New Deal to show voters they support drastic action to address climate change and the threat that numerous scientists and researchers say it poses to Earth. The ambitious plan calls not only for moving the power grid to 100 percent renewable energy by the 2030s but also a fundamental reshaping of the U.S. economy that guarantees jobs, health care and housing for all Americans. Backers say the broadly worded, nonbinding resolution is a way to spotlight an issue that will play a prominent role in the 2020 presidential election as much as it is a blueprint for solving the threat to the planet. Senate Minority Leader Charles Schumer said it's ironic McConnell would bring the resolution to the floor when he usually prevents measures he doesn't like from getting a vote. "I say, 'Go for it. Bring it on.' You think it might embarrass Democrats to vote on a nonbinding resolution that maybe some of us support but not others? Trust me. We’ll be fine," the New York Democrat said on the Senate floor Thursday. If "McConnell blocks amendments, we’ll know where he and his party stand – against science, against fact, ostriches with their heads buried in the sand as the tide comes in." Curbelo, who lost re-election in November, said he believes most Republican lawmakers on Capitol Hill agree with the science that human-caused climate change is heating the planet and posing numerous risks from increased drought, more severe weather and rising sea levels. Republicans are "evolving in a meaningful way" on climate change, and there are "very few" who share President Donald Trump's skepticism of climate change, said Curbelo, who joined the Columbia Center on Global Energy Policy after leaving office. That hasn't stopped GOP lawmakers from trying to score points or raise money from the Democratic plan. "The radical left wing of the Democratic Party has unveiled their 'Green New Deal' – a socialist fantasy to wreck our economy and fundamentally altering our way of life," McConnell wrote in a fundraising email Wednesday. "On their wish list? Ending air travel. Destroying American energy. Banning cow farts. Yes, cow farts." Senate Majority Leader Mitch McConnell, R-Ky., takes an elevator after leaving the chamber, at the Capitol in Washington, Wednesday, Jan. 23, 2019. The Senate will vote on two competing proposals this week to end the partial government shutdown, but neither seems to have enough votes to advance. "No planes. No cars. No cows," read an email from Rep. Liz Cheney, R-Wyo., using the Green New Deal in a pitch for campaign dollars. "This new proposal – the first priority of the new liberal majority – is completely outrageous," Rep. Greg Pence, R-Ind., the vice president's brother, said in a fundraising email last week to supporters. "They want to limit what you drive. They want to stop all air travel. They want to give money to people 'unwilling to work.' They even want to monitor what you eat." Republicans based those criticisms on initial drafts of the plan that called for more dramatic steps such as the building of high-speed rail "at a scale where air travel stops becoming necessary." They seized on Ocasio-Cortez's warning that the "world is going to end in 12 years if we don't address climate change," suggesting it is foolish panic. Party moderates representing swing districts have yet to sign on, and House Speaker Nancy Pelosi, D-Calif., referred to the plan in an interview with Politico as “the green dream or whatever they call it."